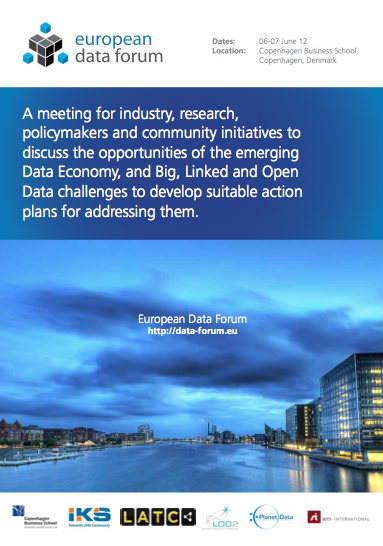 The European Data Forum (EDF) is a meeting place for industry, research, policymakers and community initiatives to discuss the challenges of Big Data and the emerging Data Economy and to develop suitable action plans for addressing these challenges. Of special focus within the EDF are Small and Medium-sized Enterprises (SMEs), since they are driving innovation and competition in many data-driven economic sectors. The range of topics discussed at the European Data Forum ranges from novel data-driven business models (e.g. data clearing houses), over technology innovations (e.g. Linked Data Web) to societal aspects (e.g. open governmental data as well as data privacy and security). The volume of data being digitally stored and exchanged is growing exponentially. We are on the verge of an era where every device is online, ubiquitous sensors generate continuous streams of data, very high bandwidth data conduits expand to carry high definition media, and information complexity rises with richly annotated content. Major data sources are the internet of things and sensors that collect data about the physical space, as well as search engines, social media sites, eCommerce portals, open government data initiatives and other similar means that produce digital fingerprints of our social behaviour. In short, the sheer amount of data offered and consumed on the Internet will steadily increase by orders of magnitude. Obviously, these data generate the potential for many new types of products and services. The accessibility of public services can be improved for open and linked data, smart traffic and cities can improve mobility, products can report their life cycles, monitoring their provenance and quality, social trends can be recognized and turned into services, and products can come closer to meeting consumers’ needs. We foresee a whole new industry implementing services on top of large data streams. The impact of this emerging economic sector - the data economy - may soon outrange the current importance of the software industry. The gist of the matter is to turn large streams of data into added value for the public and private sector. This industry can help to increase the efficiency of processes working with these data, it can provide transparency, support well-informed decision making, and enable new services not possible today (e.g., smart cities, interactive trend analysis or seamless data flows along value creation chains). Clearly, research, engineering, policy making for the Data Economy and the exploitation of the unprecedented wealth of data have become keys to the Future of Europe.